Hypnosis is all about organization and the removal of clutter. It works at the deepest levels of the subconscious to organize thoughts and allow for a free flow of information. This in turn allows us to overcome bad habits and fears and change the way we respond in certain situations. What hypnosis can do for the mind it can also do for our external environment by changing a mind-set that leads to clutter and disorganization. Dr. Steve G. Jones M.Ed., Clinical Hypnotherapist, has developed a self hypnosis program to help you accomplish this goal. 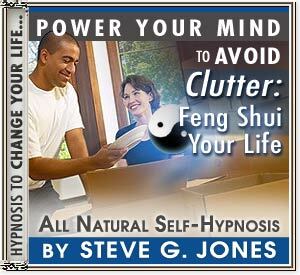 It is called “Remove Clutter: Feng Shui Your Life.” It can help you be more organization and closer to achieving Feng Shui.